He referred to his public affair with his administrative assistant, Cherie Aispuro, which has resulted in divorce from his wife. Aispuro still works for Gibson after having been removed from his office while county officials tried to determine if the pair had violated existing policy. After it was ascertained that the county had no official policy covering such personal affairs, Aispuro returned to the Gibson office. Gibson throws down the gauntlet…and the extreme elements of COLAB, tea party ideologues, paranoid conspiracy promoters, and water wasters oblige. These types are enemies of everybody, not merely political opponents. I might have added “anti-civilization zealots’, but Supervisor Gibson pretty much nailed it. Gibson threw down a tantrum, hardly a gauntlet. “Mommy, mommy, they’re being meanies and not letting me do what I want!” – pretty much summed up his tone. “anti-civilization zealots” – lol, is that the new mantra? I sure hope they don’t pay you people to regurgitate their weak attempts at propaganda. Or maybe you missed the memo: don’t use it where people can see and think for themselves, but limit the knee-jerk slogans for the uninformed and common-core-indoctrinated. Please…Go on…Don’t let me stop you. I don’t receive or solicit any ‘memos’. Thanks for informing me…informally, that “anti-civilization zealots” struck a nerve. It’s not a mantra, yet…but it could be soon with your assistance ! I have had other words and phrases of my construction added to the lexicon, or at minimum… the common vernacular. My only payment is the satisfaction of repetition. When done by friends, it is OK; but when done by foes it is most sweet. Well, Gibson certainly “nailed it,” but what he nailed wasn’t in his this article. Let’s be honest here, folks. All the statements quoted from Gibson’s materials are true. Name one that isn’t. This paranoid screed sounds like Adam Hill ghostwrote it for him after the start of happy hour. Hmmm….perhaps your focus should be one statesmanship, honor, honesty, morality, and integrity, rather than defeating your “enemies”. But does he understand what statesmanship, honor, honesty, morality and integrity are? Sure doesn’t look like it. Not with all politicians. Just the desperate ones. But what if you don’t have any statesmanship, honor, honesty, morality, and integrity? Then what? Then what? Sadly you run for political office, that’s what! Why anyone directs anger at the supplier of money and influence, rather than the one receiving it is beyond me. Then you get elected to the Board of Supervisors. Then you sit on the county supervisor chair that has “Gibson” or “Hill” on it. 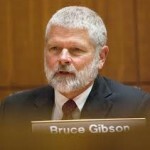 Gibson was right when he said, “aggressive and well-funded special interests have invaded our Board of Supervisors’ chambers to push an agenda of antagonism, fear and greed which threatens the fabric of our quality of life.” What he forgot to mention is that he is the invader – someone who does the bidding of those well-funded special interest groups, to the detriment of all the rest of his constituents. “fighting against those extreme elements”………..sounds like one of them! Anyone who send a contribution to this unethical person or supports him for reelection is doing a great disservice to the 2nd District. Isn’t there anyone with a clear moral compass out there to challenge this guy? We can do better than this! Yes, you will be attacked personally. YOU have fought to limit and squelch public participation. YOU have operated behind the scenes, out of public view, to place your thumb on the balance of public policy. YOU have divided and caused rift with bigoted name-calling, stereotyping and hate. YOU have ignored public comment and closed your door to constituents. YOU have been arrogant and morally repulsive. YOU have played hookie to skip out on public meetings. And of all hypocrisies, it is YOU who has ignored science and fact-based decision making, seeking instead to use alarm, acrimony, and fear as your tools. Even now, you focus on division instead of selling your positives–of which there are few. YOU will be opposed, as will your donors, Bruce. Yep. There’s some priceless footage of Mr.Gibson and his pal Mr. Hill cutting off, ignoring, and condescendingly talking down to those “paranoid conspiracy promoters” who bother to show up at the B.O.S. meetings during public comment. Whether you agree with Supervisors Mecham, Arnold, or the late Mr. Teixiera or not, at least they don’t roll their eyes, fiddle with their iPads and notes during meetings, audibly *sigh* when their detractors speak, and publically mock community members who differ with them. Email me the dates and times of those clips please. Sorry, no time to wade thru the hundreds of hours televised recordings on County website. But whoever runs against Bruce–and hopefully some brave soul WILL run–is gonna need the ammo to adequately campaign against him. Gibson’s opponent will likely have at least a couple of volunteers who would be willing to sort through the BOS videos. “Someone else will do it” isn’t helpful. WE must do it. Silence is complicity. Never let a good crisis go to waste, eh?